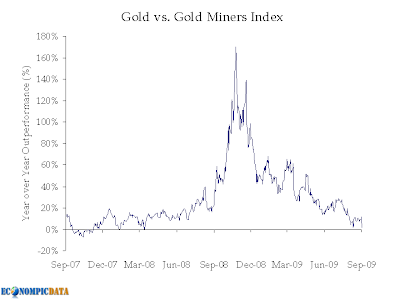 Gold Exposure… Gold or Gold Miners? Gold has been on a tear (though nobody seems to know why… hatred of all currencies has been one answer), up $70 the past two months alone. Gold companies’ shares soared Wednesday amid a sharp rally in gold prices, and one analyst said the strong performance of larger companies was a reversal from earlier in the year. Gold prices reached their highest point in nearly three months as the U.S. dollar weakened and participants bought in a flight-to-quality bid based on economic uncertainty and concerns about the stock market. Most-active December gold gained $22, or more than 2.3%, on Wednesday. Burchell said his firm is positive on the gold sector and believes the metal has come out of its summer hibernation period. Summer months are traditionally weaker for gold prices. He added gold behaved better than expected this year, but was range-bound throughout the summer. Burchell said Wednesday’s increased share prices were in part a reaction to Tuesday’s weakness, adding that investors see the "specter of inflation" down the line, leading them to speculate in gold as a hedge against that inflation. Jefferies & Co.’s Mike Dudas said gold and gold stocks can find some money in the recent weakness in financial stocks as investors look to gold for more stability. Gold prices had been quiet recently and were looking to break one way or the other and certainly did so on Wednesday, he added. So gold or gold miners? 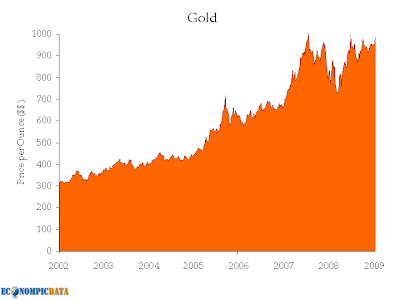 Since 2006, the metal has significantly outperformed the goldmining index (GDX) by 30% and at times by more than 170% over a 12-month period (mining stocks were CRUSHED post Lehman Brothers collapse, while the metal held up). So do I find value in gold? In the fundamental value of the metal… No. BUT, in the story… YES. As long time readers know, I am Ready to Ride the Golden Bubble.